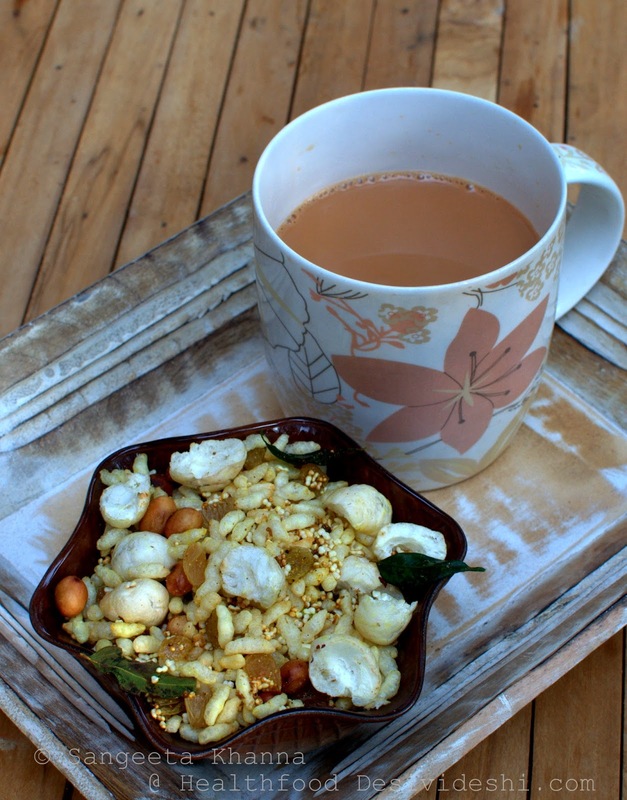 Here is a savoury snack with popped amaranth. 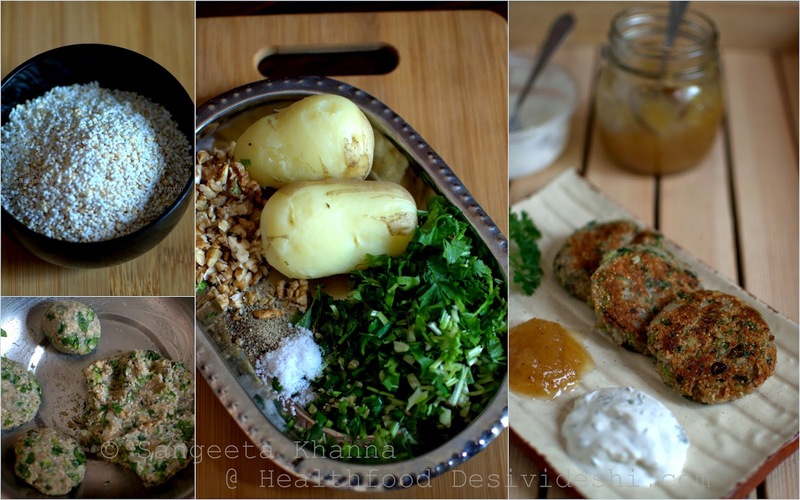 Potato walnut cakes made crumbly with popped amaranth and zesty flavors of coriander greens. 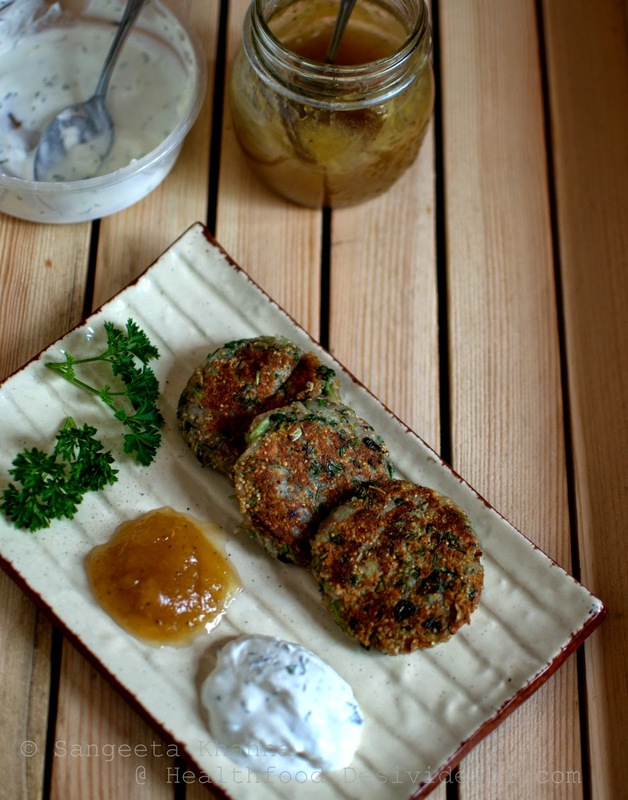 This amaranth and potato tikki is great for fasting days too, served with a hung yogurt dip and a pineapple chutney with white pepper and ginger. This is one yummy snack or weekend breakfast that you will look forward to. 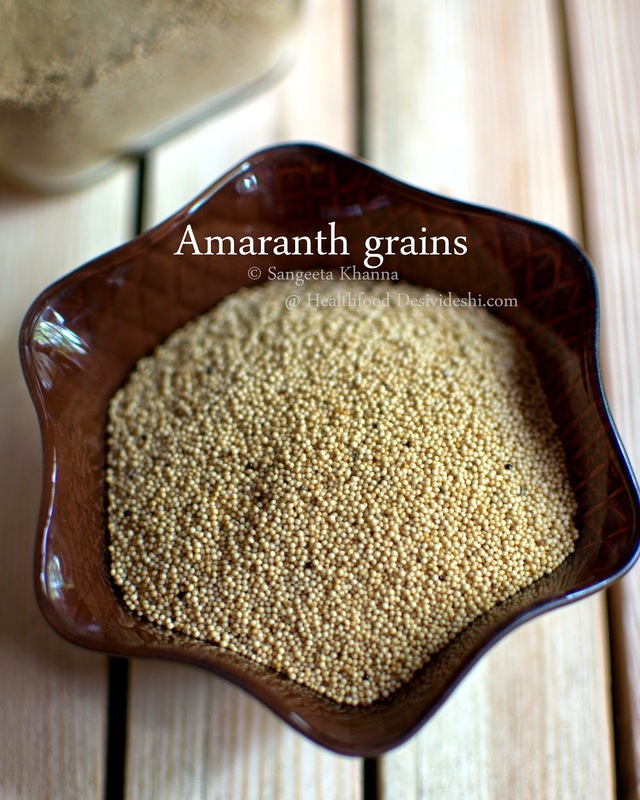 One more yummy way to include amaranth in your everyday meals. 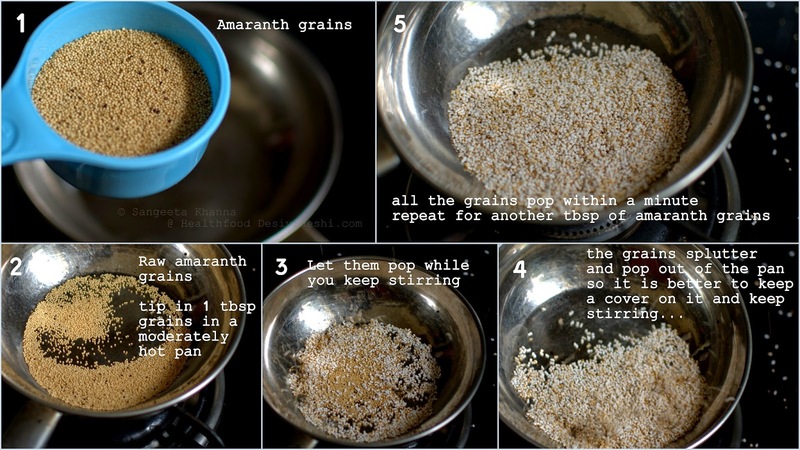 Now you know that popped amaranth grains are a versatile ingredients to stock. You can add them to your yogurt to make parfaits or milk with fruits for a healthy breakfast, make amaranth muesli, add them to pancake batter to make the pancakes fluffy, mix them with roasted nuts and some herbs to make a nice tea time namkeen. I have added them to my smoothies and egg scrambles as well. Amaranth is a high protein, high fiber and low calorie ingredient that adds a lovely taste and texture to anything you decide cook with them. One can pop them at home very easily if getting popped amaranth is difficult. How to pop amaranth grains or rajgira? This is an oft repeated question that I get and wanted to share a step wise procedure. Not that it is a tedious process, but taking the camera with a tripod in the kitchen and positioning it over the gas felt too much of work for a while. Finally I decided to pop some amaranth seeds just to take pictures today. It is a quick process if you need just one serving of popped amaranth for you parfait or breakfast cereal, 3 tbsp of raw amaranth yields about a cup of popped amaranth and takes just about 3 minutes including the heating of the pan, measuring the grains etc etc. 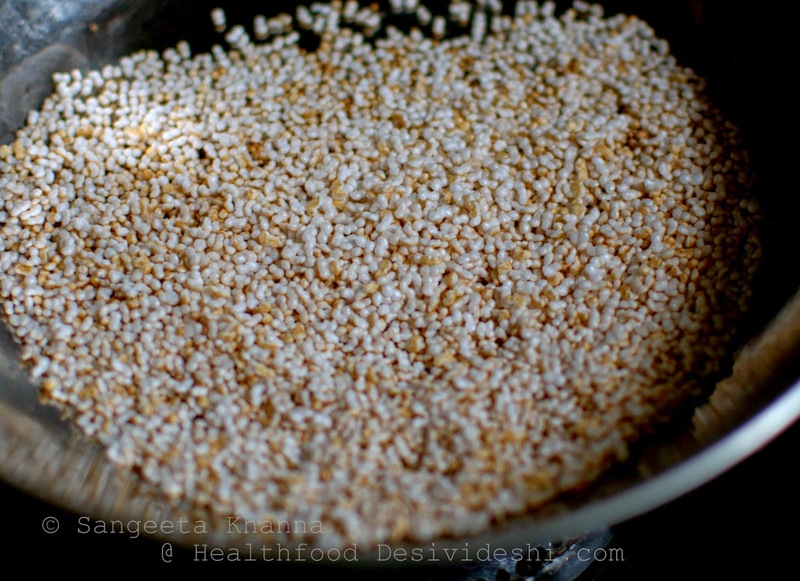 To pop the amaranth grains, heat a shallow pan over medium flame, tip in a tbsp of amaranth (rajgira or ramdana) grains into it and swirl them in the pan. They start popping around within seconds. You can cover the pan with a lid while stirring the pan in swirling movements while the amaranth pops.It takes about 30-40 seconds for a tbsp of grains to pop. Pour them in a plate and repeat with next batch of grains to pop. That's it. Store it in an airtight container if it is not going to be used instantly. 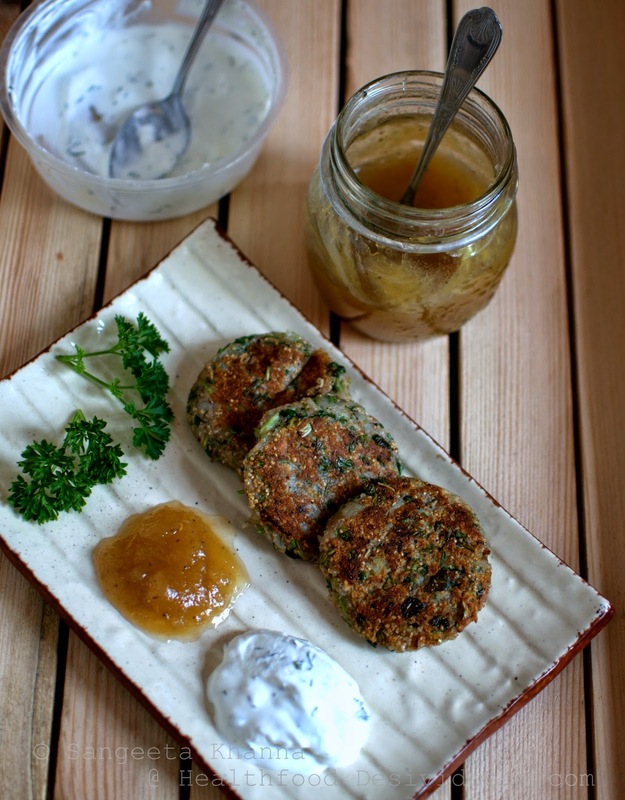 These potato walnuts savoury cakes are just like alu tikki made healthier and sassier. Serve them with whatever dips and chutneys you can make fresh or some preserved chutney like I did. This pineapple chutney with ginger and white pepper is a great accompaniment to such light savoury snacks. mix all the ingredients except ghee or oil nicely to make a dough. shape small cutlets and refrigerate for an hour or so. shallow fry in ghee or oil on a medium flame. serve with hung curd dip and a sweet and sour chutney/sauce or a green chutney. To make the hung curd dip, just chop a handful of fresh parsley (or coriander greens or mint) and mix with a cup of hung yogurt, pinch or garlic powder and salt and pepper to taste. To make the pineapple ginger and white pepper chutney, cook a cup of cubed pineapples and a tbsp of grated ginger with 3 tbsp sugar and half a cup of water till soft and pulpy. Add a pinch of salt and 1/2 tsp of white pepper powder, mix well and cook for a minute before filling the chutney in a sterilised jar. The chutney stays well for a week in refrigerator. You can always serve the savoury potato walnuts cakes with a green chutney made with coriander and mint greens. The tamarind chutney will be great with it too.